Asko Parpola writes: "Early Harappan cultures started moving toward the east and south in about 3000 BCE, and later waves of influence in these same directions came from the Indus civilization. 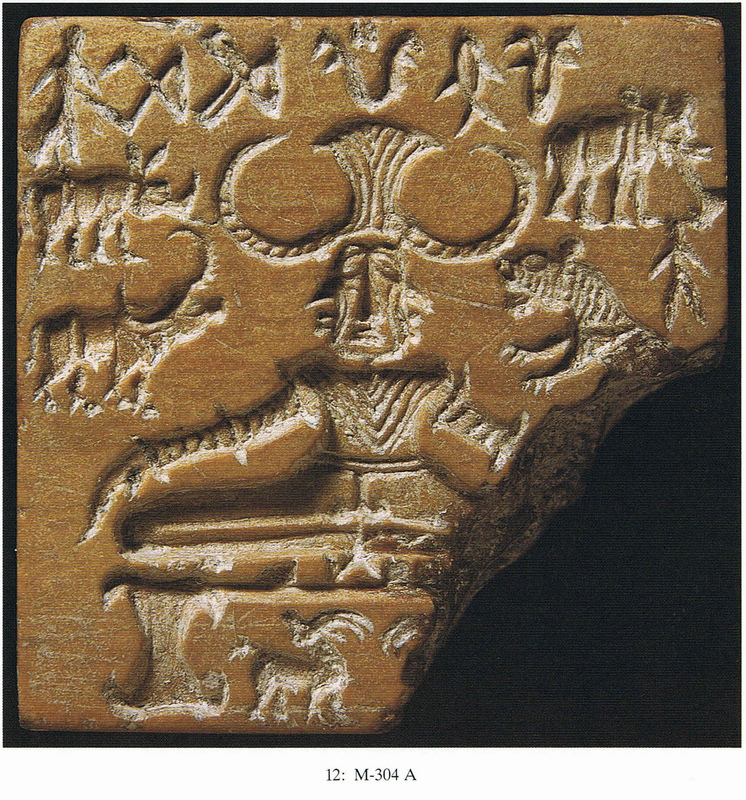 That the Harappan water-buffalo cult [Fig. 2, 3] had reached penninsular India by the late Harappan on Chalcolithic times is suggested by the large bronze sculpture of water buffalo [Fig. 4] discovered in 1974 in a hoard at Daimabad, the southernmost Indus site in Maharashtra. Throughout south India, until relatively recently, village goddesses have been worshipped through water-buffalo sacrifices. The goddesses have been associated with a male deity call the "buffalo king," represented by a wooden post or a pillar made of stone, or by the pipal tree (Biardeau 2000). In the form of worship at Kannapuram, a south India village in Tamil Nadu studied by Brenda Beck (1981), the tree-truck (known as kampam in Tamil, from Sanskrit skambha ("pillar") in front of which the sacrificial buffaloes are decapitated, is said to be the husband of the goddess. At the end of the annual marriage rite, after the last victim has been slaughtered, this trunk is uprooted and the goddess divested of her ornaments like a widow. The pillar and its uprooting correspond to Siva's phallus and its castration. The sacrificial post used to be burned after the divine marriage festival." Later Parpola continues: "If the buffalo sacrifice is common in south Indian village religion, it is absent from north Indian village religion. The reason is probably the conscious efforts of Vedic Brahmans to eradicate it. 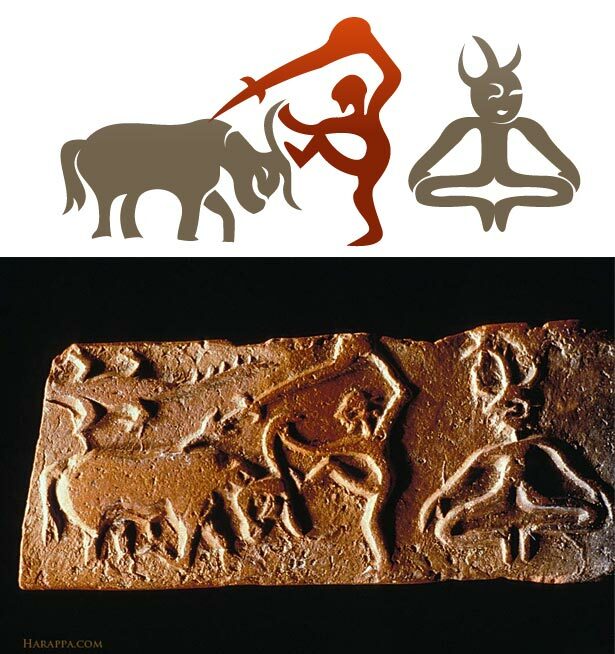 Extravagant buffalo sacrifices were at first adopted by the Rigvedic Aryans in the Indus Valley (RV 5,29,7-8 etc. ), but thereafter this mode of worship is not heard of. In the later Vedic literature (to Varuna) is mentioned in only a single context, in a list of hundreds of different animals offered as subsidiary victims in the horse sacrifice. It appears that generally speaking , the Brahmins have been fighting against bloody sacrifices from Rigvedic times onwards. In the Rigveda, the cow is called aghnya, "not to be slain," and while the Grhyasutra rules (apparently reflecting the behavioral code of the Atharavavedic India-Aryans) include the slaughter of a cow when a guest of honor is received, a later rule leaves it to the guest to decide whether this is done or the cow is set free. The Brahamana and Srautasutra texts record, even mentioning the names of the Brahmins concerned, how in the Vedic sacrifices human, horse, and other animal victims were successively discontinued, and a final rule says the proscribed victims should be made out of rice and barley paste." Asko Parpola, The Roots of Hinduism, pp. 175-176, p. 178. 1. Plano convex molded tablet showing an individual spearing a water buffalo with one foot pressing the head down and one arm holding the tip of a horn. A gharial is depicted above the sacrifice scene and a figure seated in yogic position, wearing a horned headdress, looks on. The horned headdress has a branch with three prongs or leaves emerging from the center. 2. 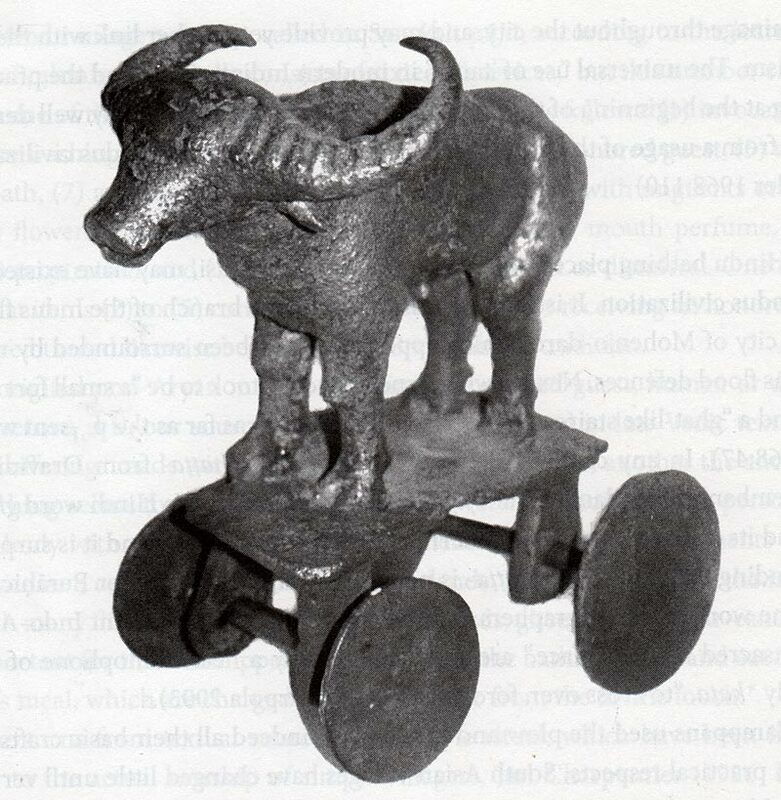 A water buffalo, 31cm high and 25 cm long, standing on a platform attached to four solid wheels. One of four bronze scultprues weighing together over 60 kg, found in a hoard at Daimabad, Maharashtra, the southernmost Indus site, and ascribed to the Late Harappan or Chalcolithic period. Photo Asko Parpola. 4. Water buffalo on painted pots of the Early Harappan Kot DIji culture. (a) A pot excavated at Kot Diji. After Khan 1965:68, fig. 16. Courtesy DAMGP. 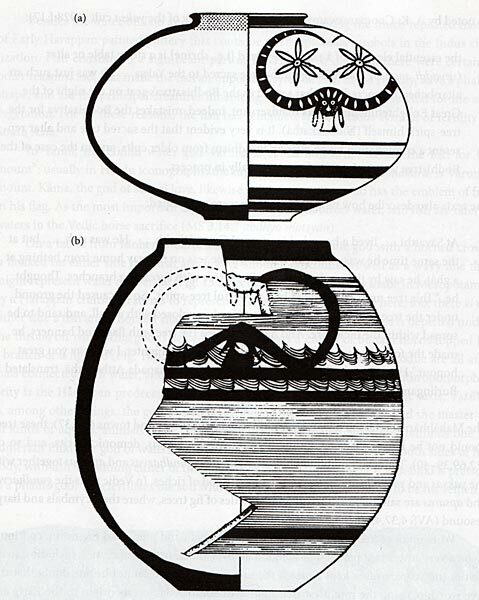 (b) A pot imported to the Northern Neolithic site of Burzahom in Kashmir, period II. After Kaw 1989:88, fig. 7. Courtesy ASI.